In the Christian life there are many ways to get off course. Just as the Apostle Paul finished his course, it ought to be the goal of every Bible-believing Christian to discover the right path and stay on that path until our earthly race is completed! The critical path to spiritual joy and a fulfilling life purpose is not found on a diagram or chart but is clearly found in God’s Word. 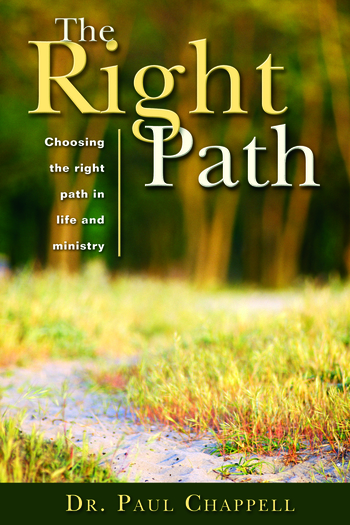 In The Right Path Dr. Paul Chappell will challenge you with seven critical keys to staying on course in your Christian life and ministry. You will explore the heart, the conscience, your life’s purpose, your life’s passion, right doctrine, right priorities, and right leadership. In each of these chapters you will be challenged, stirred, and compelled to stand strong in your walk with Christ. If you desire to finish your course on the right path, this book will help you!